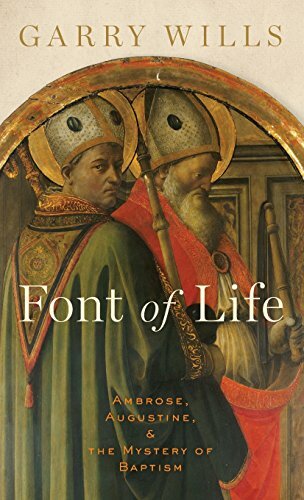 Noted historian Garry Wills explores the backstories leading up to and the particulars of the interactions between Ambrose and Augustine, seminally important figures whose paths converge when the former baptizes the latter in Font of Life: Ambrose, Augustine, and The Mystery of Baptism, which also highlights the significance of that baptism in the history of the Roman Catholic Church and its crucial importance as well as its many themes and crosscurrents. Place influences loom large—shaping worldviews, governing appropriate conduct, defining interactions—in this story published 1625 years after that memorable Easter in 387 BCE. In the early years of the first millennium and continuing through contemporary times, Rome is synonymous with religious power, exemplified by how extraordinary power within the Church is concentrated in Rome. Yet in the fourth century, near the very height of the prominence and dominance of the Holy Roman Empire, Rome was not the only place where powerful clerics, whose reach was much engaged with politics and governance, might be found, for Ambrose was from Milan and Augustine was from Africa. Coming from very different places—figuratively and literally, Ambrose from Milan and Augustine from Africa, diverging personally and theologically—the two convene in Milan, for a ceremonial baptism whose very process is informed by the place dimension of the font itself. Following an all-night vigil, Augustine is baptized by Ambrose at the dawn of Easter in 387. Given their circumstances, stature, and, most especially, very different views of the place of baptism in the Church’s traditions, the baptism is most extraordinary. The irony of the two’s profoundly different, even conflicting perceptions of baptism—its timing, symbolism, stature—is central to the telling of this fascinating history. The story of the struggles and confrontations, competing visions and strategies, respect and differences, contrasting theological visions and shared faiths of these two important theologians is explored in this illuminating telling of their fated and fateful encounter. Though the Easter 387 BCE baptism in Milan is the unifying topic of Font of Life, the real drama of the story concerns the pair’s parallel yet divergent circumstances and events that characterized their lives and relationships.